Jerk chicken is incredibly popular at Greenville (S.C.) County Schools, reports Joe Urban, director of food and nutrition services. Jerk seasoning is a mix that can vary but has two constants: Scotch bonnet peppers and allspice. Urban’s recipe also includes onion powder, garlic powder, thyme, nutmeg and cinnamon. The floral heat within this special blend of spices makes chicken a show stopper, as it was during the test run at Greenville Schools. After the positive response, jerk chicken is now on the menu for the whole district, and 76,000 students will get a chance to rip into the dish, complete with diced pineapple on top and sweet plantains on the side. Why not try jerk chicken in a different way? All the flavors of Jamaica, but grab-and-go friendly? Sign us up, mon! Caribbean jerk chicken pita (left; photo by Isabel Epstein): Columbia University Dining hosted its first Food Fight competition earlier this year, a throwdown between the university’s three residential dining halls, with celebrity chef Marcus Samuelsson leading a panel of student judges. 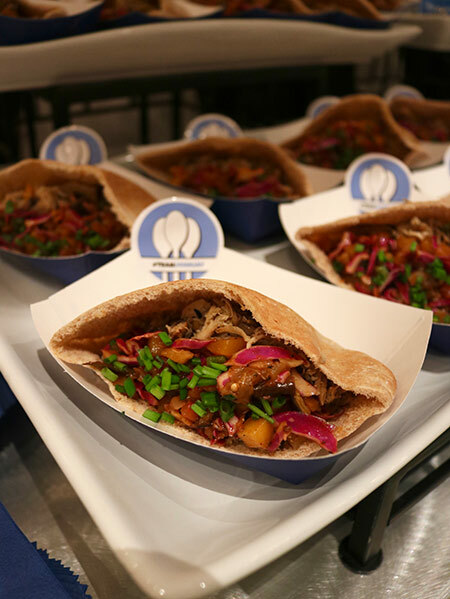 This Caribbean jerk chicken pita was the John Jay dining hall’s entry. 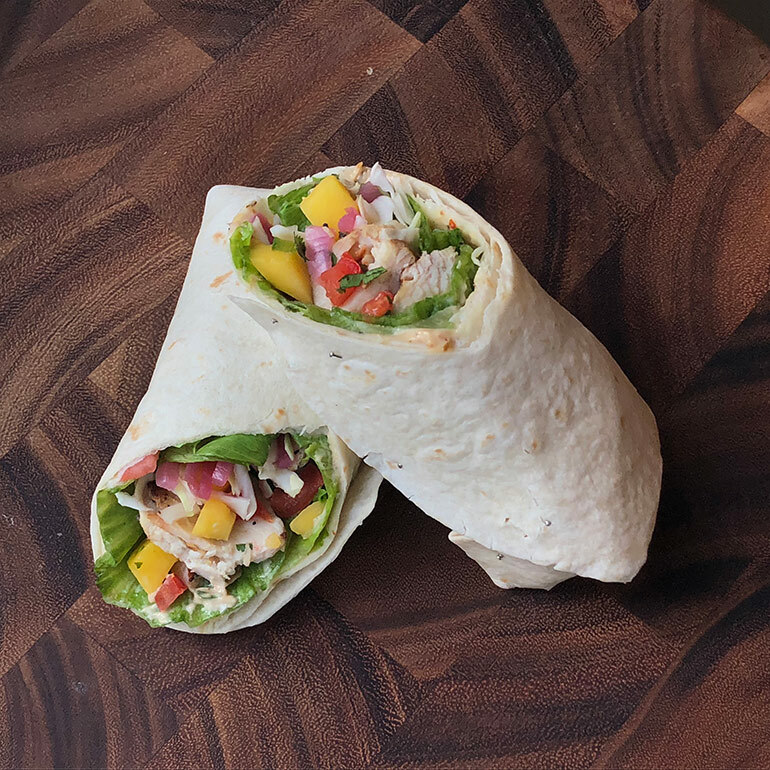 Jerk chicken wrap: Why not style jerk chicken as a portable burrito? That’s what Aramark has done with this version, developed by corporate chefs as a grab-and-go star, with its zippy fresh mango and herbs. 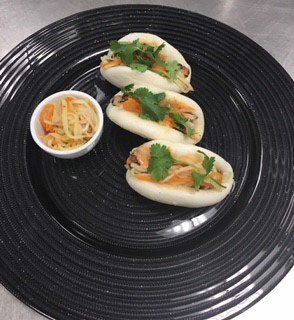 Pulled jerk chicken bao: At the National Gallery of Art in Washington, D.C., jerk chicken makes an appearance at several of the cafés, including as jerk chicken wings and these adorable bao buns. Rice and peas (referring to beans) is a great traditional side dish for jerk chicken. 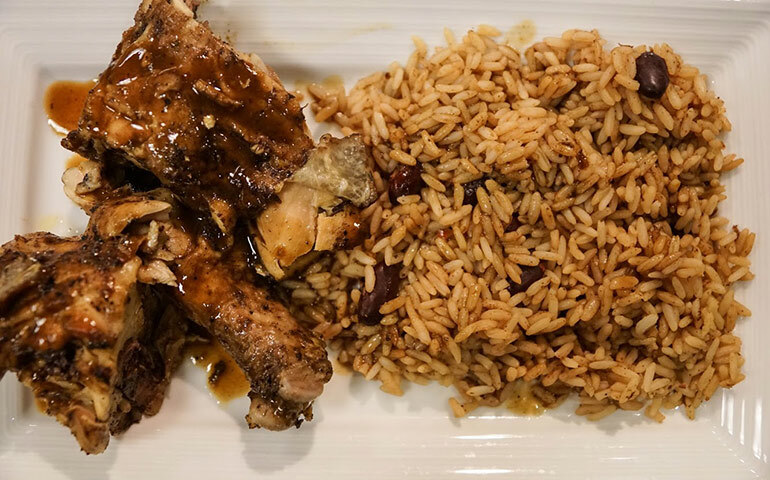 At Island Soul, a much-loved Caribbean concept at Stony Brook University, the State University of New York, the rice and peas is made with kidney beans. “The various flavors were developed over time by adding thyme, pepper, herbs and spices that blended together to form the aromatic rice and peas dish,” Davis says.